Herky the young Bald Eagle from Hayward, WI that arrived on Sunday with her leg wrapped in string from a snare is improving! She has quite a following from folks in both WI and Iowa! It is great to see people involved with this amazing little lady. 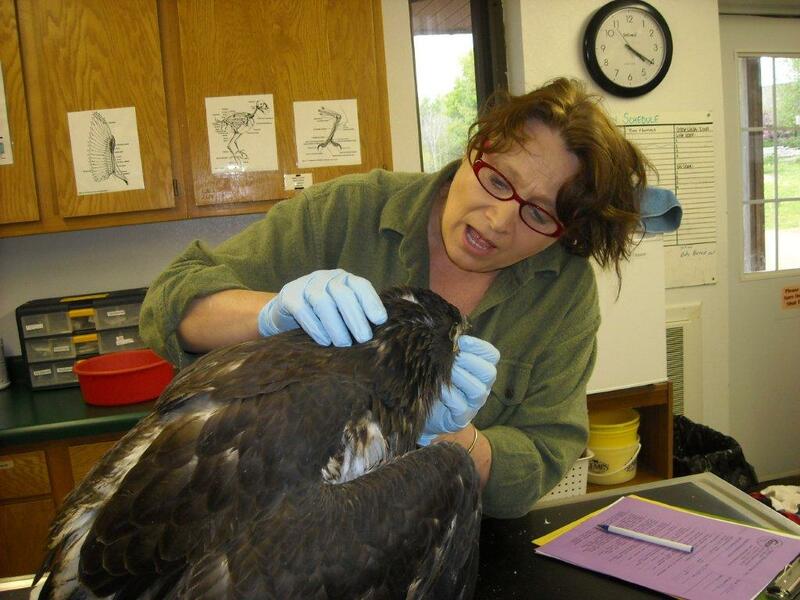 Herky the Bald Eagle from Hayward gets a check-up. Open wide Herky!! Herky with her eyes wide open:) Yea!! Herky remains in critical condition but has begun to gain a few ounces. Starving birds actually continue to lose weight after admission even with supplemental feeding. Their body is in a negative balance and it takes a bit for that to balance out. It is a scary thing to see the scale drop but joyful when it starts to move in the other direction. Herky is being cooperative and seems comfortable with her situation. She is still receiving antibiotics and an anitfungal drug to prevent aspergillosis which can occur in a bird as compromised as Herky. She is definitely happy about getting food even when it means she is getting it through a tube. We do not have to restrain her when feeding time comes! She has begun to make some soft calls which is another step in the right direction. Herky is aware of the world around her which is different than when she was admitted less than a week ago. We admitted 2 other Bald Eagles this week and she is aware that they are in enclosures next to her and is interested particularly in the adult. This beautiful Bald Eagle from Gilman, WI was poisoned. 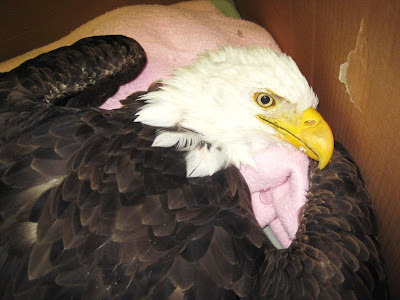 We admitted an adult Bald Eagle yesterday from the Gilman, WI area. He had ingested poison, likely an organo-phosphate. He is still convulsing from the neuro toxic affects. Before anyone can ask "why"...I will just say it is illegal and should never happen but it does and more often than you imagine. 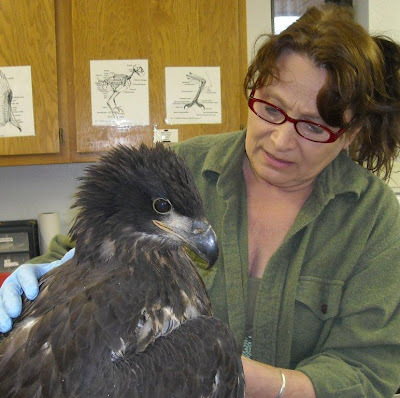 I will be up all night with this eagle. He is receiving shots of atropine to counter the affects of the poison on his brain and nervous system about once an hour. Keep us in your thoughts. I find myself wishing everyone could be with me as they watch the horrors of what this toxin does to an eagle. If people knew they would be more careful and think things through before putting out bait for wolves and coyotes. At least I hope they would be. 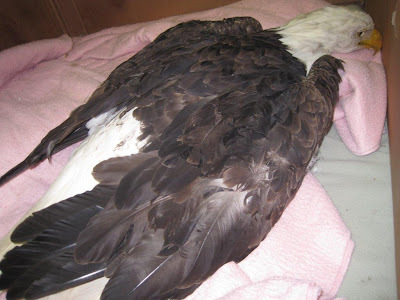 Exhausted from yet another convulsion the adult Bald Eagle from Gilman rests after being given atropine. 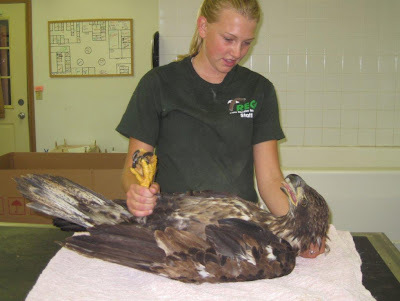 An immature Bald Eagle was hit by a car. Immature Bald Eagles are so beautiful. Their plumage is changing from mostly brown to a mottled white and brown. Our new patient has a wing fracture, but if all goes as expected we are looking for a early winter release. 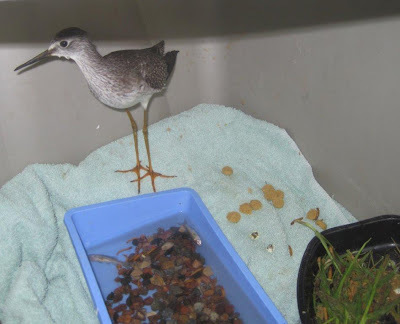 The Lesser Yellowlegs admitted last week... is STANDING! Great news on the Lesser yellowlegs admitted after having been hit by a car last week during migration. He suffered a back injury and was unable to stand until YESTERDAY! 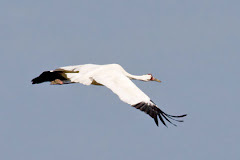 This is means he is going to be able to continue on his way south...maybe with a little help from a Wausau company that flies REGI patients south when needed to assist their migration or catch them up to their flock. He still has some conditioning to get him into shape again but his future looks rosy. He will be heading to South America so like any athlete conditioning is important. 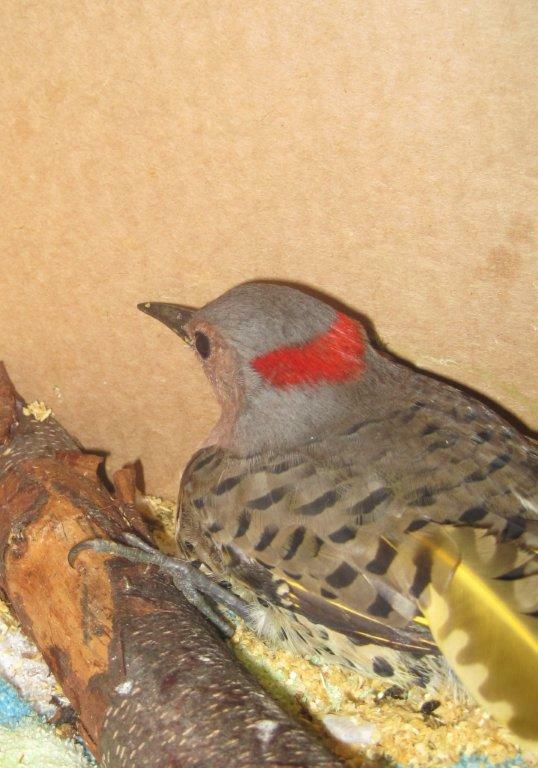 This Northern Flicker was hit by a car yesterday. Sorry about the poor photo,but I take only one photo of patients when they first come in to keep stress to a minimum. He is already making progress and eating well. I will get a photo of the osprey today to post soon. We will be releasing 5 Eastern Bluebirds and several Amercian Robins today!! It has been yet another busy week here at REGI. Have a great day everyone... enjoy the wildlife around you.